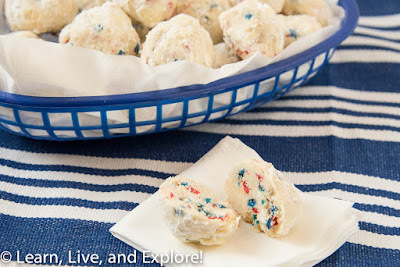 Red, White, and Blue Funfetti Cookies ~ Learn, Live, and Explore! While I am a fan of Mexican wedding cookies, the idea of swapping out the nuts for sprinkles - red, white, and blue stars in this case - was appealing to me. In fact, it gave these cookies more of a cake batter taste, as was the intention of the creator of the recipe: Crazy for Crust. I made the aesthetic modification to the sprinkle selection and removed the butter extract from the recipe (seriously, who buys butter extract? That sounds disgusting!). The result is the powdered sugar covered dry cookie you expect, but with a sweet, patriotic punch that is sure to bring smiles to a 4th of July potluck. Prepare two baking sheets with parchment paper or silicone mats. In an electric mixer, cream together butter and powdered sugar until fluffy, then mix in the vanilla extract. Slowly add in the salt and the flour, 1/2 cup at a time, while mixing the cookie dough on a low speed. Make cookie balls with 1-2 tablespoons of dough, rolling in your hands, and place on cookie sheets. Bake for 8-10 minutes, until the bottom of the cookies are light brown (longer if the cookie balls are bigger). Let cool on the baking sheet for 5 minutes before rolling the cookie ball in powdered sugar and transferring to a rack to cool completely. The cookie may need to be rolled in powdered sugar another time for coverage.